We have recently made (yet another) out of state move. As the saying goes, "there's no place like home" so we are back in Florida! With our growing family, being surrounded by loved ones is a priority. Although I am not a fan of the humidity, chain stores at every corner and general over development; I have missed the familiarity that is our sunshine state. Oh, plus I've just missed sunshine in general! Vermont will always hold a special place in my heart but I'll have to get my fix of that fresh mountain air through visits during the beautiful fall months (not the negative 20 temps! ), ha. As for now we are renting a cute little place in a great part of town. But most of our belongings will stay boxed up, lonely and missed. Since we have been house hunting and dreaming of new beginnings, I started thinking about my studio space as well as my own personal jewelry storage. After hours on Pinterest I found a collection of images and websites that I can reference when the time comes to unbox my gems and my Blue Blood inventory. I thought I would share a few images for inspiration. I can't take credit for these but you can find them on my Pinterest or sources below. I love felt lined drawers. Adding a glass top is exactly what I would get or diy for visibility. 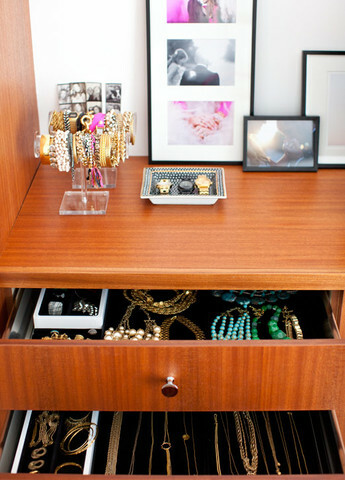 The drawers can be customized for your style and lends a cleaner less cluttered look than table top displays. Although items on the wall can begin to look cluttered, I liked the looks in these two images. The left seems to be a whole jewelry room (oh what fun my girls would have!) and the wall frames on the right are simple & organized. A great option for someone with a smaller jewelry collection. I'll be aspiring to one of these looks or a combo of them. I hope it added a little sparkle and inspiration for you too!